So, What’s Wrong with the Knicks? opp. Assists / game : 22.4 > 20. 75, STL / game: 7. 2 < 8.0061, TOV / game : 14.1 < 14.1585, DRB / game: 33.8 > 29.9024, opp. TOV / game: 13.0 < 13.1585. So, one sees that what is keeping the Knicks out of the playoffs is specifically pressure defense, in that, they are not forcing enough turnovers per game. Ironically, they are very close to the threshold, but, it is not enough. Given that the threshold for playoff-bound teams is more than 13.1585 opp. TOV/game, setting A = 13 above, we obtain: 0.435. This means that the Knicks have roughly a 43.5% chance of forcing more than 13 TOV in any single game. Similarly, setting A = 14, one obtains: 0.3177. This means that the Knicks have roughly a 31.77% chance of forcing more than 14 TOV in any single game, and so forth. Therefore, one concludes that while the Knicks problems are defensive-oriented, it is specifically related to pressure defense and forcing turnovers. Posted on February 9, 2017 February 9, 2017 Categories Basketball, Data Science, Mathematics, NBA, NBA Playoffs, UncategorizedTags data, Data Science, Knicks, mathematics, NBA, NBA Playoffs, New York, New York Knicks, Sports, StatisticsLeave a comment on So, What’s Wrong with the Knicks? I was thinking about how one can use the NBA’s new SportVU system to figure out optimal positions for players on the court. One of the interesting things about the SportVU system is that it tracks player coordinates on the court. Presumably, it also keeps track of whether or not a player located at makes a shot or misses it. Let us denote a player making a shot by , and a player missing a shot by . Then, one essentially will have data in the form . The main idea is that the parameters uniquely characterize a given player’s probability of making a shot. (The constraints are determined here by the x-y dimensions of a standard NBA court). In practice, it should be noted, that it is typically unlikely to have a player that has a 99% probability of making a shot. In this plot, the red dots indicate a player has made a shot (a response of 1.0) from the coordinates given, while a purple dot indicates a player has missed a shot from the coordinates given (a response of 0.0). Performing a logistic regression on this data, we obtain that . Using the equations above, we see that this player has a maximum probability of of making a shot from a location of , and a minimum probability of of making a shot from a location of . I’ve been fascinated by the triangle offense for a long time. I think it is a beautiful way to play basketball, and the right way to play basketball, in the half-court, a “system-based” way to play. For those of you that are interested, I highly recommend Tex Winter’s classic book on the topic. The 3 triangles that form when one triangle is filled involving all 5 players. The letters a,b,c,d,e,f,g,h,i denote the angles within the triangles. We are assuming NBA court dimensions where the 1/2 court is 47′ long and the team bench area which roughly corresponds to the top of the three-point line is 28′ from the baseline. The problem I wanted to study was given 5 players’ random positions on the court, could a series of equations be solved yielding (x,y) coordinates that would yield where players should “go” to fill the triangle? Solving this highly nonlinear system of equations with constraints is not a trivial problem! It fact, because of the high degree of nonlinearity and dimension of the problem, it is safe to assume that no closed-form solution exists, and therefore, must be solved numerically. 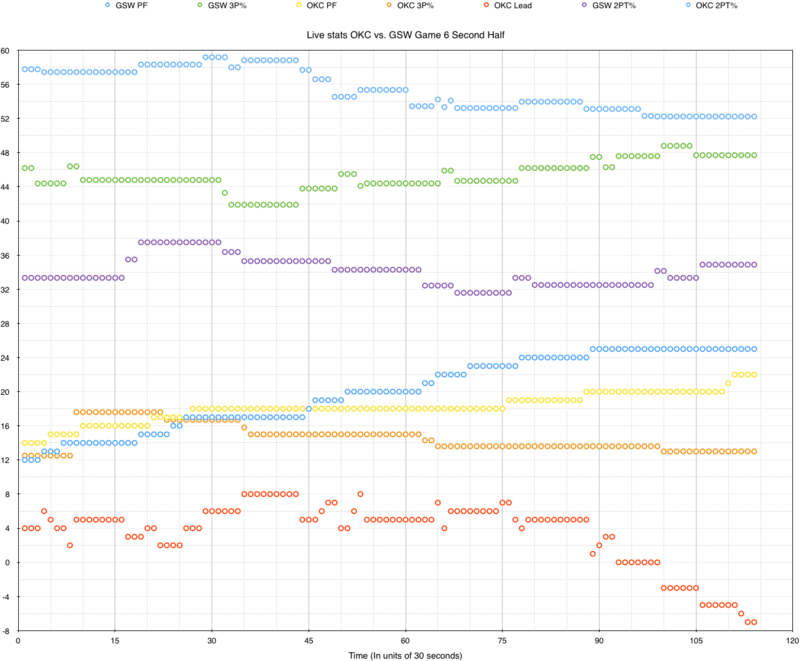 In the plot above, I have labeled the plots that converged to the triangle formation with the title “this one”. In addition, the five black circles denote the initial positions of the players on the court before they fill the triangles in the offense. One sees just by the diagram above, how difficult such a problem is to solve mathematically, even through a numerical approach. Running more trials would perhaps yield better results, but, it works! I am truly fascinated by this. In the coming days, I will work on optimizing the numerical algorithm, and post my updates as they come. In this animation above, the black dots represent the positions of the players on the court. They begin at initial (random) positions and attempt to fill the triangles as described above. Continuing with the live metrics employed yesterday, here is an analysis of the second half of the Warriors-Thunder Game 6. 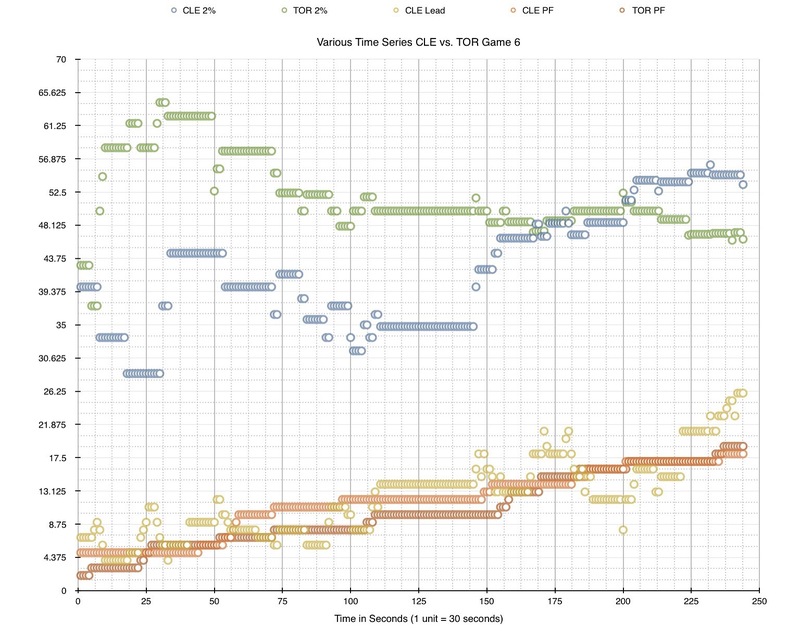 One can see from this plot for example, the exact point in time when OKC loses control of the game. One sees there is a tremendously strong anti-correlation between OKC’s lead and GSW 3PT%, while there is a somewhat strong correlation between OKC’s lead and their 2PT%. This perhaps means that for Game 7, OKC’s 3PT defense needs to greatly improve along with maintaining their 2PT%, which, as can be seen from the plot above, dropped off towards the end of the game. One sees for example that while Toronto started off the game with a much higher 2PT FG%, towards the end Cleveland ended up winning that battle. In this correlation plot, “pd” indicates point difference, “PF” indicates personal fouls, “2PFG.” indicates 2-Point field goal percentage. One sees immediately from the correlation plot above that there is a very strong correlation between Cleveland’s point difference and Toronto’s personal fouls, with some strong correlations attributed to Cleveland’s 2-Point FG% as well. The equal and opposite is true for Toronto’s point difference. It seems that during a game of this intensity in the playoffs, drawing fouls is a very important factor in determining which team leads and eventually wins in the game combined with 2-Point field goal percentage. 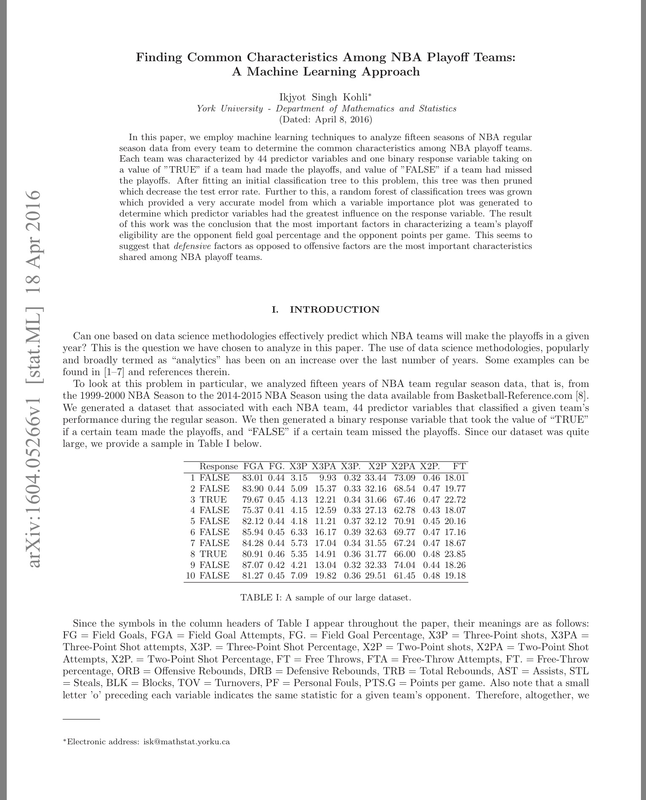 A few weeks ago, I published a paper that used data science / machine learning to detect commonalities between NBA playoff teams. 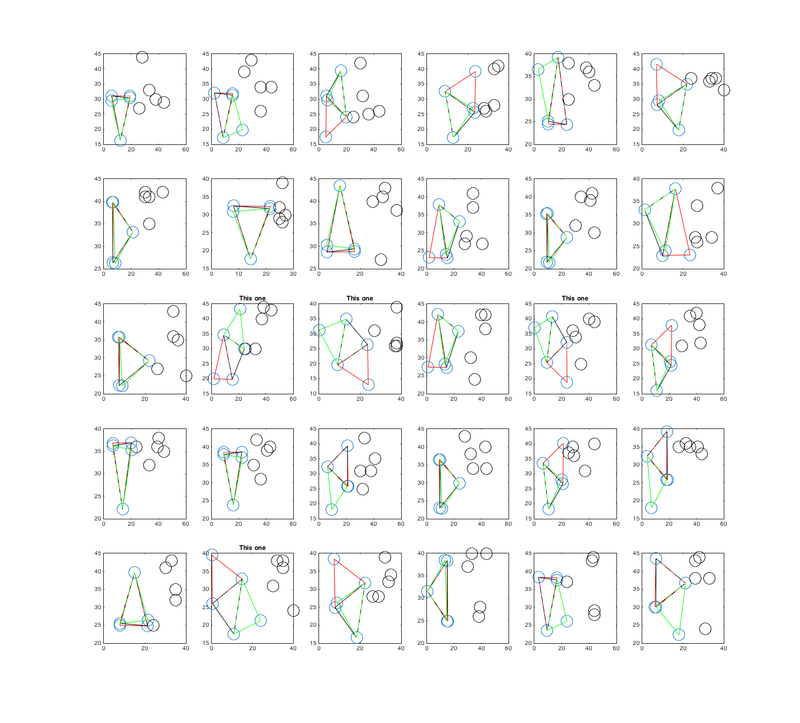 I have now updated and extended it to detect commonalities between NBA championship teams using artificial neural networks, which is a field of deep learning. The paper can be accessed by clicking on the image below.